» Meteorological data collected on Toolik Lake during the ice free season since 1989 to ppresent, Arctic LTER, Toolik Research Station, Alaska. Yearly file describing the metological conditions on Toolik Lake (named the Toolik Lake Climate station), adjacent to the Toolik Field Research Station (68 38'N, 149 36'W). 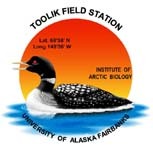 This is a floating climate station and should not be confused with the Toolik Field Station Climate site (TFS Climate Station or Met Station) which is a terrestrial station (located on land). Note that this land station has been called the "Toolik Main Climate Station", and the station on the lake is located where the main lake sampling site is located so it has also been called the Toolik Lake Main Climate Station. Measurements include air temperature, relative humidity, wind direction, wind speed, and radiation. The meteorological station on the surface of Toolik Lake was first installed in the spring of 1998. Originally the station recorded air temperature, relative humidity, wind speed, and wind direction. In 1999, a Kipp and Zonen CM3 radiation instrument was added to record the downwelling and upwelling of longwave and shortwave radiation. Measurements of all variables are taken at a 30 second interval, averaged every 5 minutes, and logged into a Campbell Scientific CR10x datalogger or starting in 2007 a Campbell CR1000 datalogger. The 2009 data set contained errors in our raw data set, where the wind direction was always from 94.8 degreess with 0 m/s in speed. these values would continue for extened periods of time, resulting in a loss of data. We collorated the wind direction and speed from the TFS Climate Station (on land) with the data from the lake station to interpolate the missing values. Please see the notes column to identifiy when this occured. Definition: Air Temperature ~ 2.5 meters height above lake surface. Definition: Relative Humidity ~ 2.5 meters height above lake surface. Definition: Wind Direction in degrees from true North, ~3.8 meters height above lake surface. Definition: Wind speed in meters per second, ~3.8 meters height above lake surface. Definition: Standard Deviation of wind direction.